From the outset, 3 Legs On Wheels decided to create music to feature new original songs performed live on the legendary Hammond B3 organ along with solid drumming. So how can just two guys make all of this sound? Other than Steffen's alto saxophone parts (the third leg? ), which could only be overdubbed, the objective was to record everything live. To that end, Steffen performed almost all of the bass parts with both feet on the Hammond's bass pedals, simultaneously adding complimentary sounds from additional modern keyboards (usually atop the Hammond). In addition to his creative fat-back drumming, Arnold (the Milwaukee Mule) provided his evocative, blues inflected lead vocals on some of the tunes. The result is a unique and organic combination of "old-school" earthiness coupled with a modern sound. Steffen Presley has been playing music since he started accordion lessons at the age of five. When he was twelve he played clarinet in the school band and won a top state award for solo clarinet. He started playing in bands at the age of fifteen in Modesto, California as an organ player after talking his parents into buying him the cheapest instrument money could by, a Sears Silvertone organ which sounded horrible but allowed him to play with a band. Shortly after, Steffen graduated to a Vox Continental organ (the pop sound of the day!) and then got a Leslie 147 speaker cabinet to run it through which he still uses to this day with his Hammond B3 organ which he has owned for over three decades now. During that time period, influenced by Lee Michaels, who had a duo with his drummer "Frosty", Steffen formed his own organ/drums duo called "Red Dwarf". At that time Steffen played left-handed bass. Influenced by the Average White band, Steffen also switched over from clarinet to the alto saxophone which was much more fun in a band setting! For quite some time Steffen has been a professional session keyboardist, with credits on many albums including some big name artists. Most recently, Steffen is credited for Hammond B3 organ on the just released Alice Cooper album, "Along Came a Spider" (August 200 which made the top fifty selling albums worldwide! He also contributed lots of Hammond organ to "Dream Factor" a solo album by Jefferson Airplane/Starship founder and Hot Tuna alum Jack Casady which featured an all-star roster. For the last twenty years or so, Steffen has been a studio owner and has produced and engineered many records by various artists around the world and in his present home town of Los Angeles, as well as releasing a succession of his own works. In Our Time Machine represents a mature approach to his Hammond organ playing. He says that it has taken this long to be able to play the bass pedals in a manner comparable to a good bass guitar player (something quite uncommon!) while not compromising his right and left hand organ/keyboard approach. Arnold Mollica, the "Milwaukee Mule", came to California in the early 80's from the Mid West, where he had worked with a lot of "horn" bands, mostly R & B style music but also rock and blues as well. Of course these large bands required a lot of mouths to feed so they usually didn't last too long. Once in Los Angeles, Arnold played with a lot of bands in rock, blues and soul venues. One of these bands was called The Tom Cats, who found some success putting out a strong blues rooted album on Rivera Records. At one point, he had the pleasure of hooking up with a fellow Milwaukee musician who played Hammond organ and kicked bass pedals, Doug West. They started an organ trio with a guitarist who played other instruments as well, and they called themselves The Bopz. There was lots of room to stretch out into different styles. Influences included Jimmy Smith, Jack McDuff, Groove Holmes, The Crusaders, BB King, etc. Arnold really enjoyed that format and hadn't had a chance to do it again for quite some time. Arnold and Steffen met in a band called the "Full Sail" band led by guitarist/songwriter Bob Fetherolf. Along with bassist Doug Deringer they remain long time friends of Steffen and Arnold. Reminiscing about their mutual affection for the Hammond organ and the styles involved, Arnold and Steffen eventually decided to form a duo which became 3 Legs On Wheels. 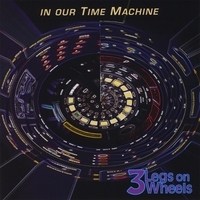 RadioIndy is pleased to present 3 Legs On Wheels with a GrIndie Award for the CD "In Our Time Machine"
"In Our Time Machine" Reviewed by RadioIndy.com!